We left Nashville in Thunderstorms delaying our departure for 30 minutes and arrived in Baltimore just 10 minutes late. Our good friend Jack was waiting at the airport for us. I wanted to take video (with our new DVD camera) crossing the Bay Bridge but Jack warned me that a few weeks ago a foreigner was arrested for photographing the bridge. There are signs asking people to report suspicious activity on or near the bridge. I decided to get some pictures from the boat instead. 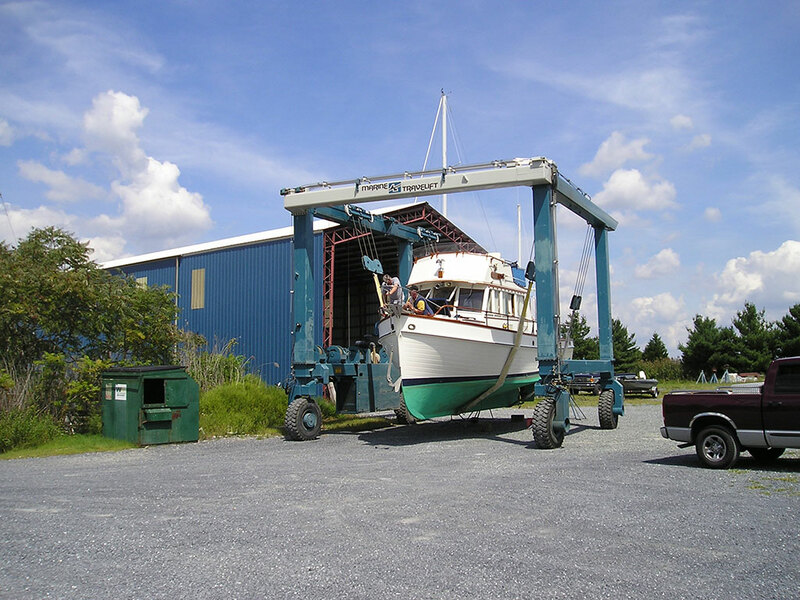 When we arrived at Dickerson Yacht Harbor at 2:00PM the Katy Leigh was out of the water with the mechanics working feverishly to finish repairing the windless. I was launched within an hour but in testing the windless the motor died. They will try to have it rewound on Friday. We finally left Trappe about 4:00PM and cruised to Oxford. The Trappe Creek and Choptank River are the setting for Michener's book Chesapeake so it was fun to see what he was writing about. Devon Island only existed in his imagination but we went right by where it was supposed to be (see photo) before it was washed away. In Oxford several people were out in the streets to watch about 6 police cars with sirens speeding down the main road to the Morris Hotel and ferry boat jetty. Tomorrow we will try to find out what happened. Oxford is a small peaceful town so this was an unusual incident. Hopefully the windless will be fixed and installed tomorrow. We will spend tomorrow in Oxford and curise to Annapolis on Saturday. The weather forecast for Monday and Tuesday is not good and may be the tail end of hurricane Francis so Annapolis could be a good place to hole up for the bad weather. This leg is only 650 miles and we have 26 days so there are a lot of weather days available.